My honey Magnolia: Christmas Blog Hop! Io sono stra felice perché vi sto scrivendo dallo stand Magnolia a Abilmente di Roma. Sono con la bravissima Tina! Presto vi mostrerò le foto! Oggi inizia il primo blog hop natalizio sponsorizzato dalla Magnolia! Basta cliccare su tutti i blog delle bravissime Dt che trovate qui sotto elencate e lasciare un commento su ogni blog! Io ho realizzato una scatolina usando il nuovo timbro Tilda with trumpet della collezione Waiting for Christmas e il background è Vintage Swedish della collezione Special moment. Il sentiment e le carte sono Magnolia. I fiori Woc e the ribbon girl. Hello girls .. are you ok? I am so happy because I'm writing from the Magnolia booth at Abilmente in Rome. I'm with the talented Tina! Soon I will show you the pictures! Today begins the first Christmas blog hop sponsored by Magnolia! Just click on all the blogs in the hop, which are here listed below and leave a comment on any blog! The winners will be announced in a week. 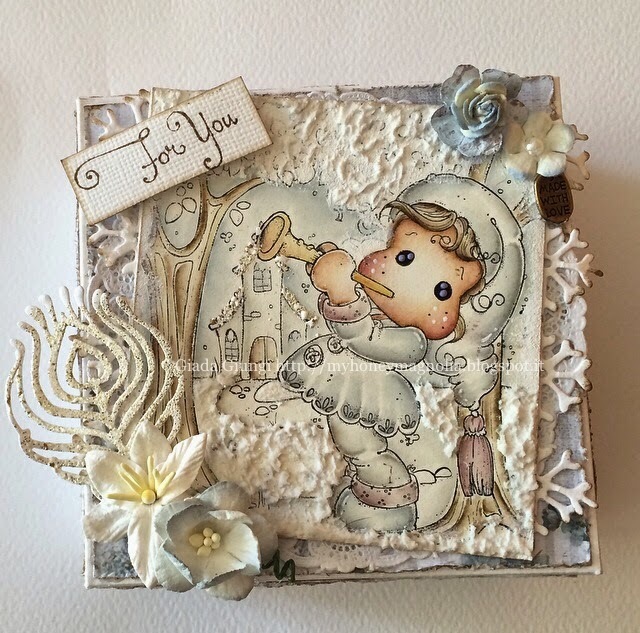 I have made a box using the new stamp Tilda with trumpet from Waiting for Christmas collection and the background is Swedish Vintage from Special Moment. The flowers are the ribbon girl and Woc. Isn't this box just adorable!!!?? The snow effect is great! I super like the coloring! This box is perfect. How did you make the snow effect? A wonderful Christmas gift box love all the beautiful details. Wow!!! Your card is stunning. The detail is full of festive loveliness and your artwork is amazing. Hugs and thanks for a super blog hop. Beautiful masked Stamps... Lovely Soft Coloring! I fell that she is letting us know that Christmas is soon coming!! And that we should prepare!!.. The box is Beautifully Decorated.. and the snow looks Amazing!!.. Great job!! Perfect Decorated!! Thank you for the chance to win!! cara Giada, la tua scatolina è davvero bellissima, come ogni tuo lavoro del resto. E' stato davvero un peccato non poter venire a roma ... sarebbe stato bello poterti riabbracciare e acquistare qualche nuova Tildina... speriamo che la prossima volta magnolia torni a vicenza. Complimenti giada! Card deliziosa e dolcissima! Sei bravissima. La scatola e meravigliosa. Vedere tuoi lavori dal vivo è stato emozionante. Your giftbox is gorgeous, love the blue's and the whites. Tilda is beautiful coloured and i love the little church in the background . Thanks for the inspiration !! Your box is gorgeous! I love the the light blue and white and all the snow. An absolut gorgeous box here too. You girls have really rocked my world here today, everything has been so gorgeous and so amazing, that I sit here with a smile from ear to ear. Love the combi of your stamps! So beautiful, I love the gorgeous texture on here! Wow it's a beautiful box!! Wow, this is just gorgeous! Love the shabby white color you used, every detail is perfectly executed. Thanks so much for the inspiration. Meraviglia!ma.....Bergamo o Milano?? ?noi vi aspettiamooooo prima o poi!! I like your soft colours/colouring. A perfect box to give away the nicest of chritmasgifts! Awesome! so beautiful, love the snow effect, look so real! Your box is gorgeous. It makes me feel that Christmas is already here. Love the little scene on your Christmas box, it's so delicate and beautiful! wow so, so beautiful and your colouring just love. Your box is super sweet dear Giada - wonderful work !!! Bellissima scatolina! Il design e fantastico e Tilsina colorata favolosamente! Meravigliosa scatolina: quello che mi ha colpito di più è il colore delicato. buonasera Giada ! 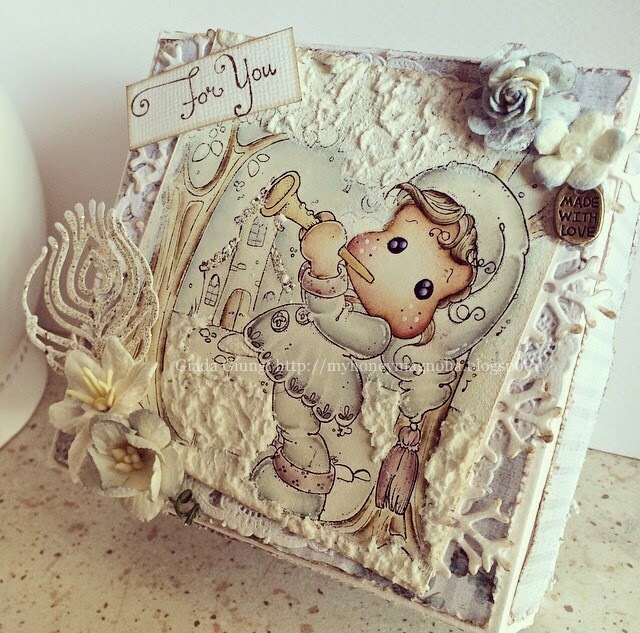 !fantasic gift box,love your coloring and snow details!! This is a beautiful card box , very pretty! So pretty, with lovely colors! What a great box did you make,and the magnolia you've used is such a sweetheart.I like your coloring,beautiful!I love all the details you've used on your card. Le tue creazioni sono fantastiche!!! Complimenti!!! Bacioni!!! Wow, adorable. A stunning project. This is so cute! Great stamp combination! I allways love what you put together, it allways looks great, sweet and pretty. Cara Giada, ti ho scoperta per caso, ma è stata una bella scoperta! Il tuo stile sempre elegante e raffinato rende ogni tua creazione un successo! Questa scatola è veramente splendida! Devo ancora capire come fai a fare quelle ombre perfette nelle tue colorazioni! Ma io e i distress litighiamo da sempre, e quando vedo un tuo lavoro lo guardo e riguardo per cercare di capire come riesci a rendere tutto così perfetto. 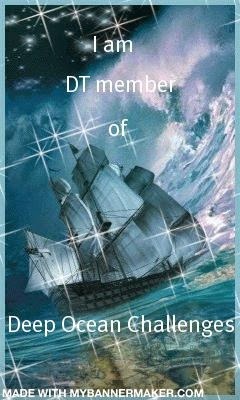 Complimenti per far parte del DT Magnolia il tuo talento non poteva non essere notato! This box is gorgeous and lovely. thank you for divide with us! 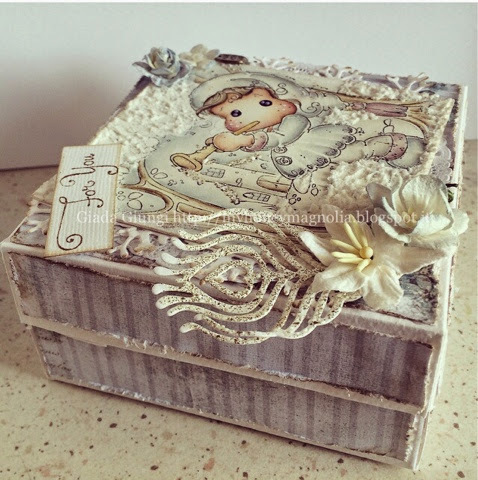 Beautiful box Giada! Love it! And it also was a pleasure to see your photos from Rome! Stunning! Looooove your Soft Colours and your Beautiful Layout! Enjoy your Week!